Rinz off water removable markers from Dykem leave temporary marks on non pourous surfaces. Dry time is 45 seconds and leaves no ghosting. Test on surface before extensive use. 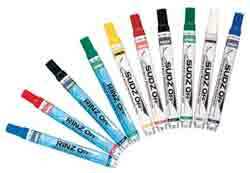 SUDZ OFF marks can be removed with detergents and is ideal for in process marking. Dry time is 15 to 20 seconds.